So much is different when you make a Chanel-type jacket following couture methods. The first thing that is strange is that once you have made a fitted a toile, you must then remove the seam allowances from your pattern(😱😱😱) and then pin the pieces to your fabric. Now comes the important part: you have to trace tack all the stitching lines around each piece. All the balance marks and notches have to be transferred too. It takes a while. Interestingly the lining in one of these jackets is quilted onto the fabric. But as you can see below, large amounts of seam allowance are left to allow for fitting. The jacket outer is assembled using machine stitches and the lining is all joined using hand stitches. I have loved the hand stitching. The fronts of the jacket are underlined with silk organza with the front edges stabilised by a stip of silk organza selvage. All of which are hand sewn onto the jacket. I have also made samples of different types of buttonholes. The rule with Chanel jackets is: never a button without a buttonhole. Even the decorative ones on the sleeve. So progress is being made. I am now making the fringe for the trim. More photos to follow. The amount of work is such that sewing takes priority over blogging! A Chanel jacket! What a thing to have in your wardrobe! Well from next week I am starting to make a copy but utilising all the couture techniques that were originally used. Claire Tyler is running a workshop over several weeks to enable her students to make their jacket. Traditionally a wool tweed has been used. Linton has been one of the preferred tweeds. I was so excited that a while ago I bought the most beautiful tweed from there and was thrilled with it. A beautiful teal colour with fabulous texture. Isn’t it beautiful? Sadly the photo does not pick up the beautiful silver thread in it which makes the whole cloth have a subtle shimmer. I was all set to make this jacket from this fabric until I read Mary Funt’s blog “Cloning Couture“. This lady is one of most exquisite seamstresses I have ever come across. Her attention to detail is exemplary and I just wish I had an ounce of her talent. But embedded in her blog post was a lament about the loose weave of this fabric. I decided that this was not the fabric for me to start my Chanel journey. I stroked it a couple of times and gazed at it, then wrapped it back up and ordered a tighter weave fabric. I will use it once I feel more confident with the method of construction. They should look good. The colours on here have not translated well but I will keep you up to date with progress. I intend to lengthen the jacket and may use just one set of pockets. I want it to be a jacket to wear over trousers or a pencil skirt. I also have an idea of making a dress to wear under it but would I wear it? Claire, my tutor, studied with Claire Schaeffer, the designer of this pattern so I know I shall be learning from the best. There is no machine stitching in this jacket and the lining is quilted to the jacket. The structure of my course is that there are 5 days of tuition with two to three weeks between classes to enable us to finish the handsewing. So, despite my anxieties, I am going to have a go and do my best. I will keep you posted! My last post was seven months ago! Shameful! Life took a major swerve and much of what was anticipated in my last post did not happen, least of all the Portfolio course. I was so sad to have to postpone it but my deteriorating hip meant I could not even climb the stairs to the sewing room and my planned-for operation in August was brought forwards to May. Holidays were cancelled, plans put on hold while I embraced a ceramic hip and trips to the gym. We are all still together! So delight of delights I am back into focusing on my sewing and more importantly thinking about how to make the most of my fabrics, my sewing skills and the space I work in. in this post, I am going to review my plans from seven months ago and then will post separately about the forthcoming plans and projects not least for my sewing room which is having a major makeover. In the last post I wrote about things I intended to make. Some of those have been finished some have been shelved and some are still on track. The Marfy dress is still in the pipeline. The LBD is on course for this winter. Fortunately the dress and coat for a wedding was made and having made a toile and re-cut the pattern, I am going to use the same for the LBD. I did not make the short jacket but the dress was lovely and after all the fitting work, was perfect. It was made in burgundy dupion silk fromThe Silk Route. I underlined it in silk organza and lined it with bremsilk from MacCulloch and Wallis. It has a beautiful weight to it and feels heavenly to wear. I made a Sculptural Bucket Coat from Sew Different using Denim Lace from Marcy Tilton. I bought this a couple of years ago when I just loved the fabric and had no idea what I could use it for. In the end it made a great wedding outfit and I was thrilled. I really recommend Tree’s sculptural bucket coat it is lovely and can be made in all sorts of fabrics. The next challenges are the Chanel Jacket next week (more of that later). In the meantime my finger has twitched over some fabric purchases. Ideas still in the pipeline for them but some are beginning to form. Good to be back! See you very soon. What a welter of work! I have been busy as you can see. Partly because of our forthcoming trip to South Africa but also because I shall be doing my Portfolio Course Level 3 with Claire Tyler in April. It involves making a Moulage following the Kenneth D King method and from there producing a range of advanced level work. We are required to pattern cut one outfit and to attend 10 workshops on top of our tutorials and create a range of work to be shown at a fashion show in June. I have a number of events coming up which provide me with opportunities to make so exciting things but I need to up my game and work to couture finishes. I have tried to be very particular in my sewing recently but this will take things to a new level. The trick with all of this is to use the techniques appropriate to the items being created. I am hardly going to bring a couture finish to a T shirt but I might to a jacket. It is fair to say that I shall be working very hard as I need to produce a file of samples of different techniques along side the completed work I shall be showing. I started off this weekend by making a very simple boiled wool swing jacket. The pattern is by The Makers Atelier and is one which has enormous potential for translating into different types of jackets depending on fabric and interpretation. I decided to Hong Kong bind all the seams with very pretty Liberty Lawn binding. I was careful not to bind the sleeve seam though as I didn’t want little flowery material to be showing on the outside of the jacket. As the fabric is boiled wool there was no need to hem it. I re-shaped the facings so that they would sit better with the jacket given the weight of the wool fabric. A lovely make which I am itching to make again. Several more on the to-do list then!! How often do we buy a T shirt? The answer is “Frequently”. We often do not pay much, don’t expect a wonderful fit and are prepared to throw it out when it pulls out of shape. However, I decided to put those days behind me. I had been seeing quite a few Concord T shirts appearing on-line and noticed that despite the pattern being for a seemingly ordinary T shirt, the variety of outcomes was endless. Making a T shirt should ensure a great fit and exactly the length you require. Mine are never long enough! What is necessary in any dressmaking is spending time getting the measurements right and often making a toile to tweak things a little. I decided to dispense with a toile. I wanted to use Art Gallery Fabrics jersey and I knew that a cheap substitute would not behave in the same way as the AGF jersey. So I spent a lot of time measuring and adjusting the pattern before cutting into my fabric. I have a Janome overlocker and would not be without it and I suspect that making a T shirt would not be as easy as it is if I didn’t have one. But I used it to the max with this top. I am delighted with the outcome. Being a larger lady, the reality of it is that no T shirt fits well. They are either baggy or too tight. But this is just as I wanted it to be. I love the rounded ends to the front and back and I messed around with the sleeves (again!) and designed my own cuff to put on the sleeve to achieve the look I wanted. I think my posture needs looking at, The wretched hip has made me a bit lopsided but the shoulder seams do fit exactly despite these pictures! Would I make another? Of course! The fabric is upstairs waiting to be cut. I would tack the neck band before stitching to be really sure of a good fit but now that my pattern is ready to go, I can see a load more being made in a variety of jerseys and colours. I wanted to make some more clothes for my holiday and one of the patterns which I had set my sights on was the Stylearc Patricia Rose dress. Apart from the fact that it appeared a very comfortable dress, I am always rather intrigued by some of Stylearc’s approaches to things. They often use a slightly different method of doing things than the traditional way. Stylearc patterns have very little in the way of instructions and mostly the instructions set out an order of work with detailed instructions only for things done in the “Stylearc manner” or where there is a definitely challenging procedure. The bit I liked about making this dress is that the band under the bust is not a band at all but rather it is a fold in the fabric in the bodice which is stitched in place once the skirt has been attached. The “band” is in fact only on the front part and not all the way round. The sleeves were a little long on this and I decided to do my own thing and not just roll them up. My fabric was not very attractive on the wrong side and I didn’t want it to show so I took a very large hem up and then folded back the sleeve to make a cuff which was then stitched in place. All in all I was very happy with it and I can see myself making another one of these in a plain linen which I think would show off the detail of it a little better than the print does. Here are some photos (taken by my mother!) so please excuse the rather poor quality. I had always fancied making a man’s shirt and a year or so ago, I saw a lovely shirt being made by Kim, one of my sewing buddies. She pointed me in the direction of the Fairfield Shirt by Thread Theory, a Canadian indie company. The beauty of the Fairfield is that it has a variety of collars, cuffs, sleeve lengths and even patterns for the gentlemen who have a bit of a tum! I bought at that time some beautiful pink linen and had a real desire to put some details on it such as facings and inside cuffs in Liberty Lawn. There it sat gazing at me for quite some while until I made a decision to just GET ON WITH IT! My task was made easier by the fact that despite the shirt pattern having some excellent instructions, there is also a “sew along” on Thread Theory”s blog with different pictures and advice. I bought some proper shirt collar stiffening and set to. I did some samples of the sleeve placket to ensure that I had it right and I also played around with buttonholes on my machine. So here is the finished garment. Photographed on a hanger as the owner is a little camera-shy but it fits beautifully and I am delighted with how the collar has turned out. Hopefully I shall grab a photo or two of him in it on holiday! Here is a photo of the placket and cuff. Would I make it again? I can’t wait. I love the need for accuracy and the range of different techniques that a shirt asks of you. A challenge but a really enjoyable one! Although we are only 10 days into 2018, so much has been going on in my life with sewing and planning that it feels like I am way behind with the blog. But not so! I decided to take on Sarah Welch Gunn’s challenge called RTW Fast 2018. The concept is easy. No buying Ready To Wear (RTW) clothes during 2018. Fabric, patterns etc may be bought but only underwear, accessories, shoes etc may be bought. That is a real challenge! I signed up, having assessed what the pinch points in my wardrobe are and having noticed(!) that I have a wedding to attend in July so something will need to be created for that. Sarah has run a previous RTW Fast in 2016 which I followed on her blog Goodbye Valentino. It has been fascinating seeing how the group of over 1,000 participants have responded. Some have worked flat out, some have tidied their sewing rooms, some have dabbled a little and I have made a dress for our upcoming holiday. I wanted to try to create something that was fairly unstructured and easy to wear. It will be quite warm in South Africa and I always find dresses much cooler than trousers etc. I bought the Makers Atelier pattern called The V-necked Shift Dress. I used a crepe viscose which I bought from Bloomsbury Square Fabrics and started to make it. The pattern was not difficult and the sizing was great for me. I am carrying a lot of weight at the moment and I wanted something flattering. Despite the great cut and the lovely fabric I still needed to insert a godet under the sleeve to allow for extra movement. I also hope that if I lose some weight, that the dress will still work for me. Although I love the shape and it was easy to make, I find it hard to justify paying the amount of money that the Makers Atelier charge for their patterns. Yes, they are beautifully drafted, yes, the presentation is excellent and yes, you do get a cute little label to put in the back of the dress BUT similar patterns are available from Stylearc at a fraction of the price even if you buy them ready printed as opposed to a pdf. So………onto my next make. This is not for me but instead is a man’s shirt for Chris. It is the Thread Theory Fairfield Men’s shirt. I have never made a man’s shirt before and am already rehearsing my run and fell seams! I am making it in a pink linen with a Liberty Fabric used inside the collar stand and cuffs. Wish me luck! I suspect it may prove a challenge! Although I started this a few months ago, my sewing has not been continuous. How come when we have ideas and thoughts, life seems to conspire against us so that we are taken off course? Not everything is negative because most of the interruptions have been pleasurable and joyous but nevertheless, taken off course is what I have been! So it was a real pleasure to spend 2 days at the Midhurst Sewing Rooms with Claire Tyler. I thought it completely decadent to spend two days enjoying myself when Christmas is looming and especially when I am expecting the whole family to descend for our annual pre-Christmas party only 36 hours later. Strangely I think I was able to re-charge my batteries through it all. But it was nearly not so! It wad designed by Koos Van Den Aaker. I was completely drawn in to the detail on the front, the pretty sleeve and the fact that it seemed to hide a multitude of sins! Before I make anything, I read a lot about the patterns and styles on www.sewing.patternreview.com and on any blogs I can find. The general consensus seemed to be that the dress was enormous when it was cut. So I did what I always do……….. I ignored the sizing and worked to my measurements. This meant that my size was actually 3 sizes smaller than the one I usual work to. I still suspect that I might be removing more from the side seams! What I did not reckon on, was that the pieces needed to be cut from single unfolded fabric. As I was using 150cm wide linen and 150 cm wide georgette for the sleeves, I was exhausted before I had cut it out with trying to anchor the wretched fabric to the table when actually it wanted to fall off at any moment. Thank goodness for Claire who cut the linen out on the floor while I battled with the georgette. It took all day to cut it out. I am using a medium weight red linen and cotton mix by John Kaldor. I bought it from Minerva Crafts but the pretty georgette I am using for the sleeves came from Marcy Tilton. I decided to use a glazed cotton from Bloomsbury Square Fabrics for the appliqué bias strips. Although there is a small difference in the photos here, the top red (the glazed cotton) is more of a tomato hue whereas the linen is a blue red. The appliqué is what this dress is about so I set about assembling it. I have made a good start although I seem to have yards and yards of hand-cut bias binding!! Let’s see how it all works out! One of the biggest differences I have noticed since returning to dressmaking, is the vast array of choices of patterns. I sewed frequently and with enthusiasm right up to returning to teaching at the beginning of the 1990s. At that point, the choices were simple: Vogue (much loved by me! ), Butterick, McCalls and Style and Simplicity. If you were adventurous you could buy Burda, a German pattern manufacturer, who sold their patterns via magazines with multi-sized centre sheets for use to create their styles. You had to be brave! No seam allowances were included and all the patterns were printed on top of each other so cutting out the pattern pieces was a challenge in itself. Today, much has changed. Style has disappeared and Burda, having been bought by Simplicity, has gone over to the traditional method of selling patterns through catalogues and using envelope-style packaging. Their magazine still exists for the die-hards! But beware – their pattern block is designed differently and favours those with broader shoulders and upper chest area. Six issues of the magazine “Sew Today” showing the latest pattern releases made up in different fabrics as well as information on yardage etc at the back of the magazine. The magazine is delivered in the post. A free Vogue label to sew into finished garments with each Vogue pattern purchased. As most patterns with Vogue work out at about £15, this is more than worth my investment. I probably buy at least 4 patterns a year which means that I save £6 each time and then of course the magazines technically only cost me about £1.50 each. What’s not to like? And what a range of these there are! This is the area where there has been the biggest change. Today there are literally hundreds of different designers producing their own range of patterns. Some come in the traditional form: sold packaged in an envelope and offering several sizes in one package. Others come via the medium of the internet. You can buy an on-line pattern which will be sent to you as a pdf for printing (digital format). This has its challenges but they are easily dealt with and also have advantages too. Stylearc – an Australian pattern house which supplies patterns through pfd files. They do sizes up to 32 and you can buy them on Amazon who will supply them ready printed but it is worth noting that not all patterns are available through them. 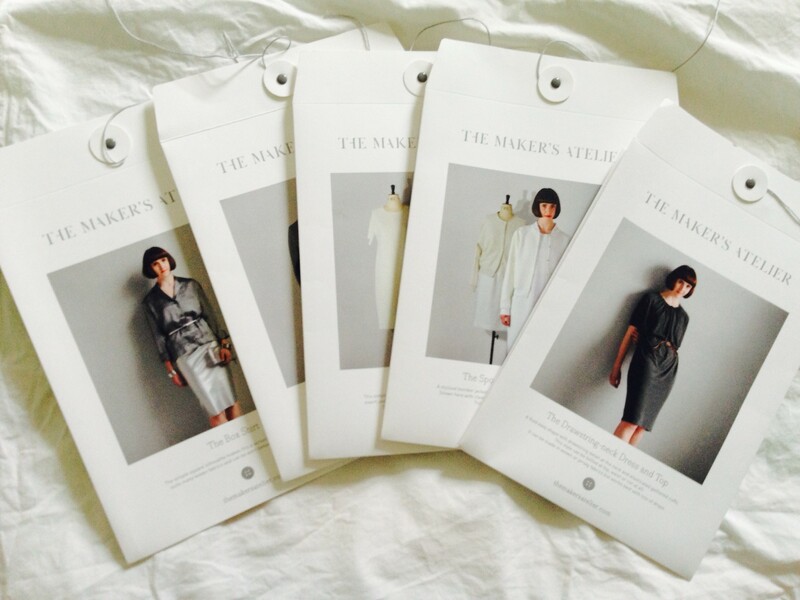 The Makers Atelier – a designer from Brighton, Frances Tobin, created the brand and designs these classy and classic clothes. They come ready printed on great quality paper and with great instructions. Most of their patterns come in a variety of sizes up to Size 22. Oliver and S and Liesl and Co – an American company that designs for men and women but also for children. (I love their designs for kids!) The link I have given you takes you to the children’s page and from their you can navigate to the adult section. They sell in both digital (pfd) format and paper but the packaging from the States and delivery etc is prohibitive and you may have to bit the bullet and go for the digital offering. I hope that has lifted the lid a little for those who are newish in this area and I will give you more information in the coming weeks.